Sonia Ben Ammar Photos, News, and Videos | Just Jared Jr.
Bella Hadid was sparkling while stepping out at the 2018 Cannes Film Festival! The 21-year-old model hit the red carpet at the BlacKkKlansman premiere on Monday (May 14) in Cannes, France. Bella looked stunning in a silver halter gown with a low back and some simple accessories. The day before, Bella met model Carla Bruni and the duo happen to look a lot alike! “Do I have a hidden daughter? ❤️ @bellahadid,” Carla captioned the photo. FYI: Bella is wearing an Elie Saab gown. Bella Hadid and Sonia Ben Ammar wear black and white to the Fashion For Relief charity dinner and runway show held at Aeroport Cannes Mandelieu on Sunday (May 13) in Cannes, France. The models were also joined at the event by Winnie Harlow. The Fashion For Relief charity runway show is in it’s 13th year at the Cannes Film Festival, where Naomi Campbell brings together celebs to help raise money for different charities. This year’s theme for the show is Race to Equality to focus on health, education, and culture. Fashion For Relief will raise money for Save The Children, as well as the Times Up movement. FYI: Bella is wearing a custom Julien Macdonald dress. Winnie is wearing Roberto Cavalli. Sonia is wearing an Ermanno Scervino suit. Kristen Stewart strikes a pose inside Vanity Fair‘s celebration during the 2018 Cannes Film Festival held at Albane by Costes, JW Marriott Rooftop on Wednesday night (May 9) in Cannes, France. The 28-year-old actress shined in a silver-y Chanel dress for the party, where she joined singer and model Sonia Ben Ammar. Just before hitting up the soiree, Kristen stopped to take a few pics with fans – and the cutest one was with a young fan. You can check out the pic below now! Sonia Ben Ammar just released her brand new song “Ocean” over the weekend! The 19-year-old model turned singer released the song under her new moniker, SONIA. In addition to her new single, SONIA made her live performance debut this past weekend at none other than the 2018 Coachella Music Festival. SONIA performed alongside Zhu for a teaser of their upcoming collaboration “Love Trippin”. The next day, she joined Petit Biscuit on stage for their song “Creatures Come Alive”. Stream “Ocean” below and be sure to download the song off iTunes! 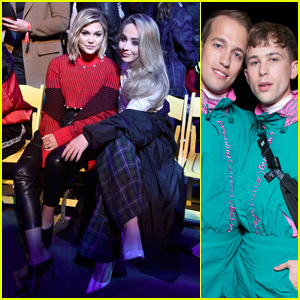 Olivia Holt, Sabrina Carpenter and Tommy Dorfman are having such a great time at Disney! The three stars all showed off their passion for fashion at the Opening Ceremony Spring 2018 x Disney Show on Wednesday night (March 7) at Disneyland in Anaheim, Calif. The collection was inspired by the “True Original” himself, Mickey Mouse. The collaboration is a global celebration of Mickey‘s heritage, personality, and status as a pop-culture icon.